Side A: recorded May 4, 2016 live on CJSW by Whitney Ota, Calgary, Alberta. Mixed by Chris Dadge at 606 later that year. DL: vocals / SS: guitar / HH: guitar / ML: bass / CD: drums, vocals. Side B: recorded live in various locations around the world and in rehearsals around Calgary between early 2011 and the summer of 2016. Mixed and assembled by CD at 606 in the fall of 2016. DL: vocals, alto sax / SS: guitar / HH: guitar / CD: drums, guitar / SM: drums / DH: bass / DP: bass. 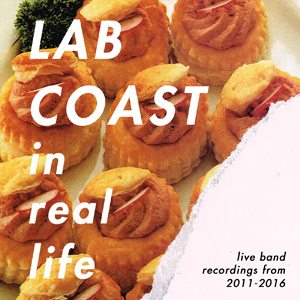 The original version of ‘Waiting’ was the third Lab Coast song ever recorded, and can be found on the Wilding album. Thanks to the extended LC family, roommates, neighbours, and John Oswald for inspiration.